** For the sake of ease of communications, I’ve copied some screenshots and annotated them. I’ve also underlined the keyword as I talk about them. 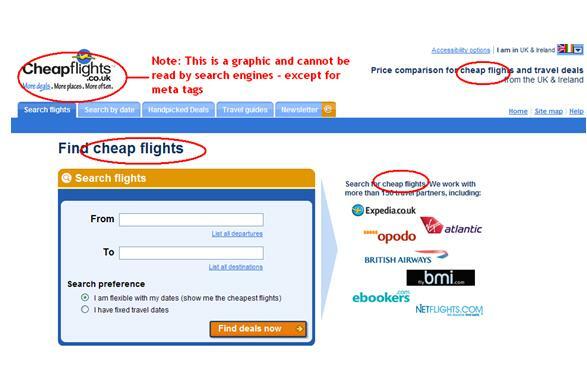 The Homepage comes up, and above the main search box (the function and purpose of the website) the keyword ‘find cheap flights’ appears. This is not put there for human use. The human has already clicked at Google or on an advert. They already know what to expect. They don’t need to be reminded as such – most web surfers scan read and their eyes will simply jump to the function of the website. Featuring the keyword first ensures that search engine robots read it first. This means the site will score well for topic relevancy. The keyword is featured extensively throughout the body of the homepage, but! They don’t keyword spam. 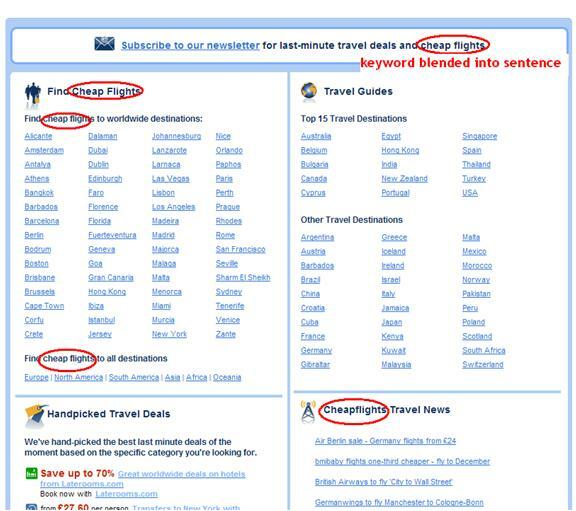 They don’t try and integrate ‘cheap flights’ wherever they can. The keyword is always placed in context, where relevant to a human reader. Search Engine algorithms look at keyword density, for example if your page has 1000 words in and 250 of those words are your keyword; you have a keyword density of 25% - this is unacceptably high for both humans and search engines. Equally an incredibly low keyword density will leave the search engines wondering what you’re on about. Focusing on one specific keyword for each page is important. You’re more likely to rank well for that keyword than if you “dilute” your page trying to go for multiple keywords. Focusing on one also gives the page some structure for the human reader. Get more Search Engine Optimization keyword tips in my Web Bulletin - plus free bonuses!